You may have walked right by this place, the Palazzo Colonna in the middle of Rome, and noticed nothing. Given the number of stray pieces of architecture strewn around town–columns, cornices, pillars, carvings, and building blocks–the plain exterior walls of this property can easily go unnoticed. 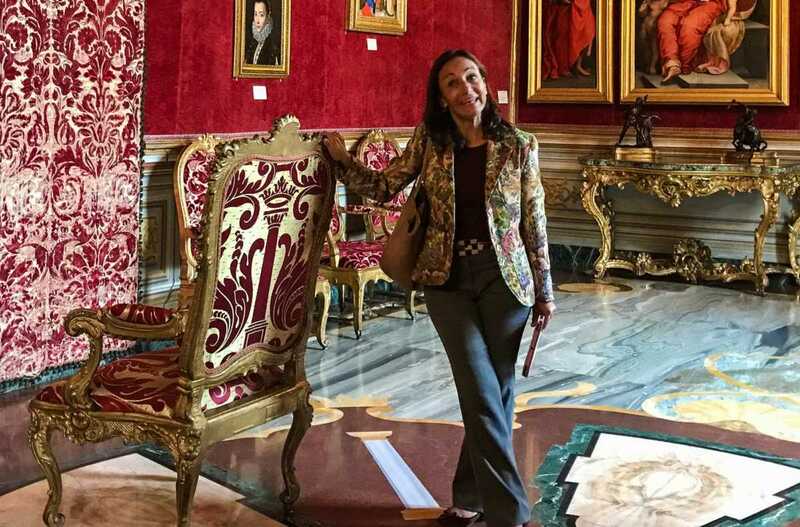 But the Palazzo Colonna is worth a look inside, and Context Travel’s exclusive tour of Palazzo Colonna is the way to see this secret treasure of Rome. The grounds are right near Piazza Venezia at the top of the Roman Forum, opposite the Colosseum. Palazzo Colonna stands out from almost every other historic Roman church, museum, or palace, because it is still a residence. It’s also a museum with limited visiting hours, but four Colonna brothers and their families currently live in the palace. So when it comes to guided tours of Rome, this is an exceptional one. 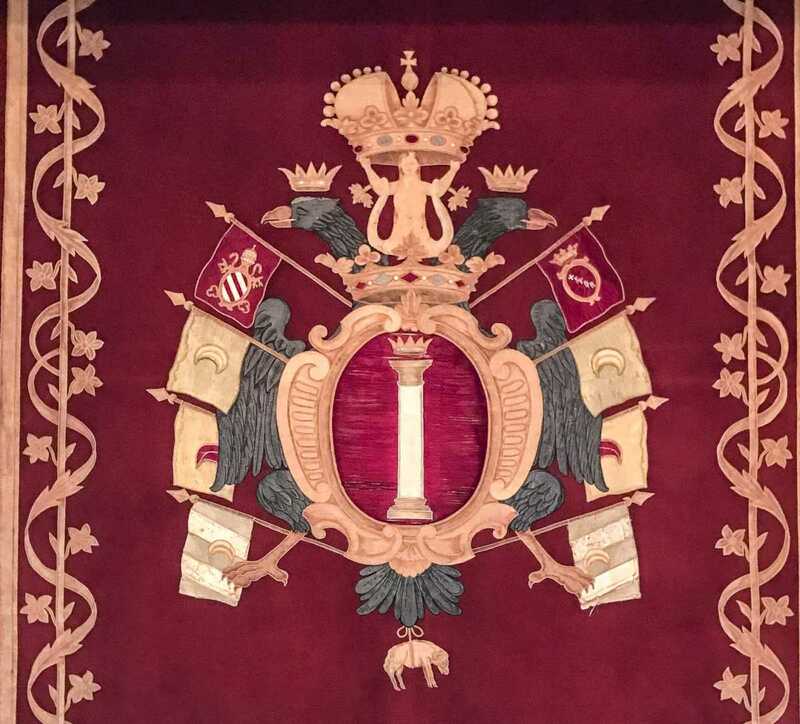 The Colonna family crest, with a column (colonna) and references to Church and the Battle of Lepanto, is found on floors, tapestries, and furniture throughout the palace. In the 13th Century, when Rome was largely in ruins, a Count from outside of Rome settled on this property which then encompassed all the Quirinal Hill, ruins of the giant Serapis Temple (built in 212 A.D.), and Trajan’s Column. In the ensuing years, the family’s land and importance increased through marriage, acquisition, ties with the church, and political and military successes. The Colonna family has included one Pope (Martin V, who saw the papal seat return to Rome from Avignon) and more than a dozen Cardinals. The family crest underscores the family’s ties to the Church and to the strengthening of Rome after the Great Schism. 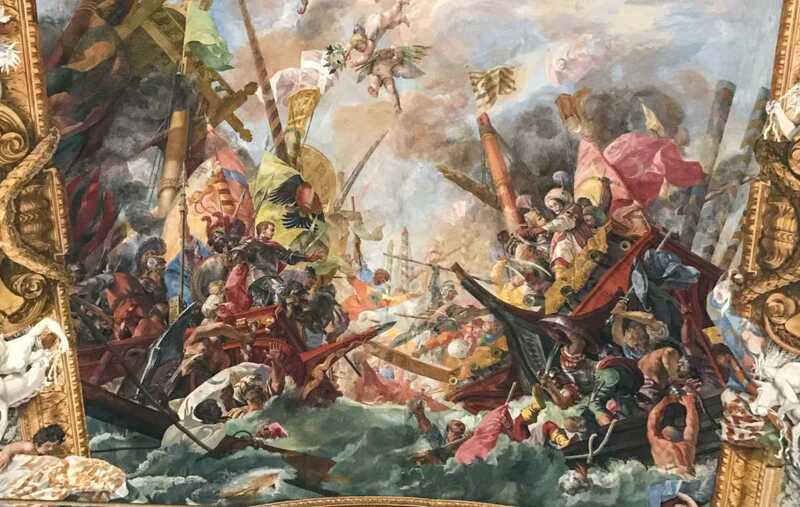 It includes a column (colonna) and also references the important naval Battle of Lepanto, in which the Holy League defeated the Ottoman Empire in an engagement led by Commander Marcantonio Colonna in 1571. 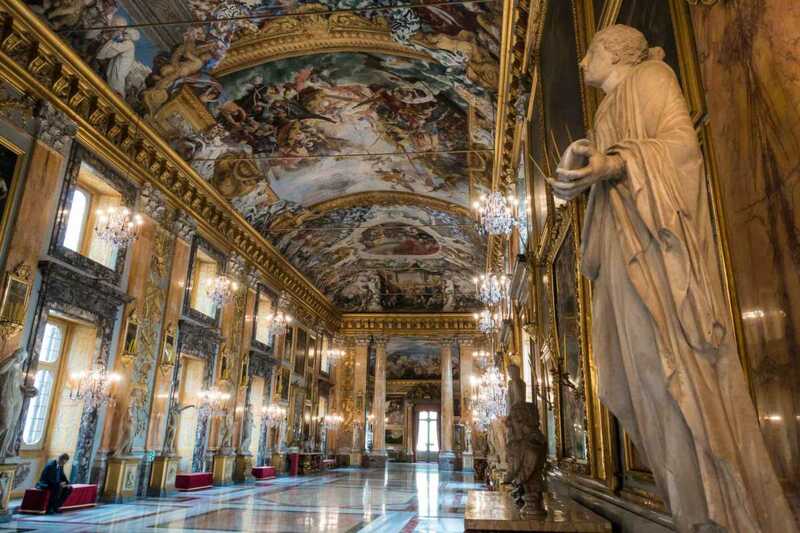 While following the family history and story of Rome through the centuries, visitors can also take in the important art collection and architectural developments of Palazzo Colonna. Continuously inhabited since the middle ages, the palace was extensively renovated in the 17th Century, and offers an unusually complete look at the lifestyle of the ruling class, especially over the past 500 years. The guided tour begins with a series of rooms hung with art from the family collection, set with authentic period furniture, and showcasing wonderful marble floors, tapestries, sculptures, chandeliers, and other decorative arts. Resources from and images of Italy are tantamount. Multi-colored marble floors use stone from every corner of the country. 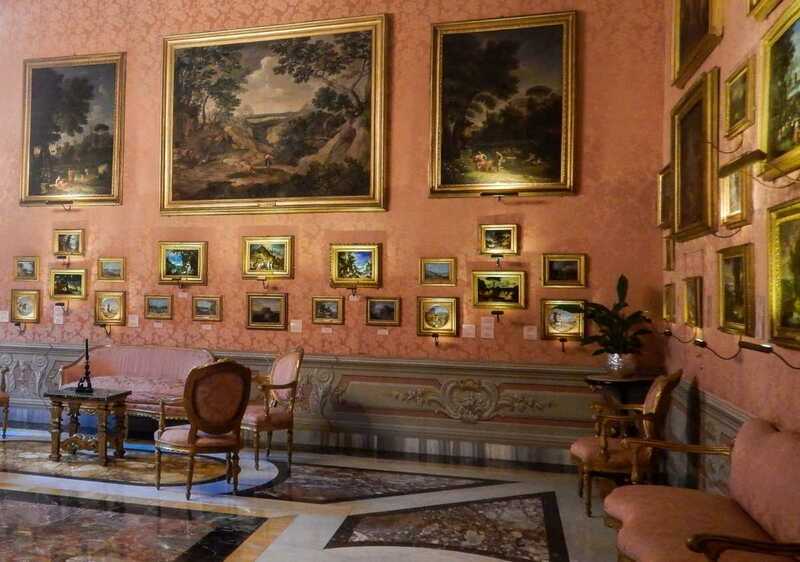 The family’s art collection lines the walls of Palazzo Colonna. The collection’s prize pieces include Bruegel (younger and elder) in a roomful of Dutch paintings, and a wealth of 15-18th Century depictions of Italy. In fact, the collection of cityscapes was referenced when Rome’s Piazza Navona underwent renovation, in an attempt to capture the original colors. Other precious art, including work by Rafael, was sold when troubled times required payment of dues to sustain the Colonna’s church and secular status. Following these public rooms are more intimate living and sleeping spaces. Once part of a 15th Century outdoor arcade, later enclosed, these rooms open to a large courtyard (one of three) and utilize trompe l’oeil paintings to emphasize the easy relationship between interior and exterior spaces. These quarters are decorated with family pictures and precious household items, like clocks, vases, and small statuary. Two women in particular influenced this property. Maria Mancini, married to Lorenzo Colonna, was responsible for the 17th Century improvements and the incorporation of seven neighboring palaces into one household. She had three sons with Lorenzo before fleeing to France until Lorenzo’s death. The Great Gallery Hall built under her direction, and contemporaneous with Versailles, is the showy, grand receiving hall designed as an expression of the family’s high position and ancient lineage. Princess Isabelle was the 20th Century protector of the Colonna palace and art collection. She maintained the palace over the dark period of World War, strengthened ties with the Church, and is largely responsible for opening this private home to the public. Our Rome tour guide, Alessandra Poli, shows us the throne room chair turned toward the wall, meaning the Pope isn’t expected today. Throughout the palace, these two created spaces worthy of personal and public life. The art collection is enhanced by magnificent marble floors and impressive Baroque furnishings. The Pavilion Room showcases intriguing grotesque-style paintings hearkening back to ancient times. The private chapel reveals the personal religious practices of the family, and the throne room is arranged not for princely audiences, but for papal visits. Even the plaque celebrating centuries of continuous Colonna family life inspires visions of both personal pride and the larger social implications of power and influence. 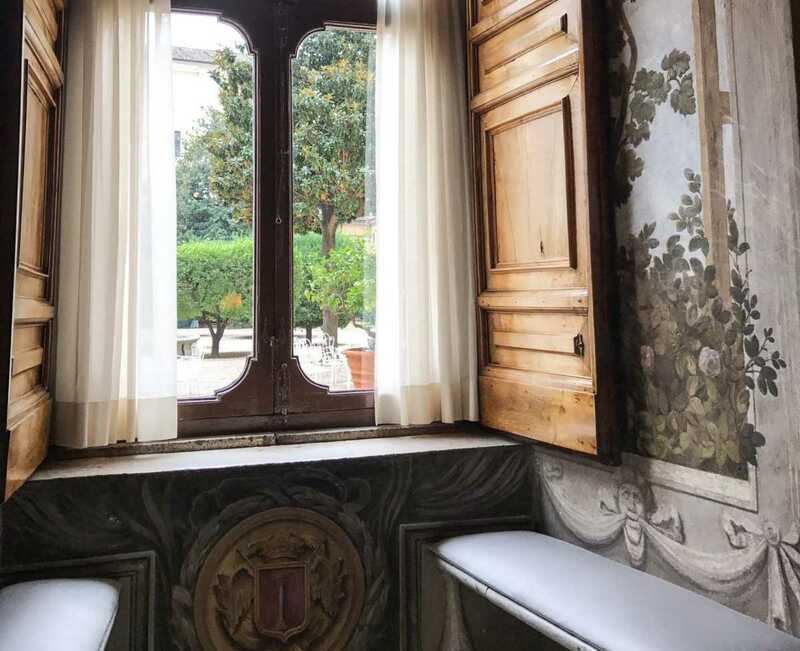 Context Travel’s exclusive tour of Palazzo Colonna provides an unusually intimate view of Roman history and power. We’d never heard of the venue, despite our many visits to Rome. Now we’re happy to recommend their “Exclusive Tour of Palazzo Colonna” to anyone interested in the long story of Rome from the Middle Ages to today. Context Travel hosts Tom and me on tours around the world. (This time they included our son and grandson, one of whom slept through most of the visit.) Context specializes in very small group tours led by experts in their respective fields. 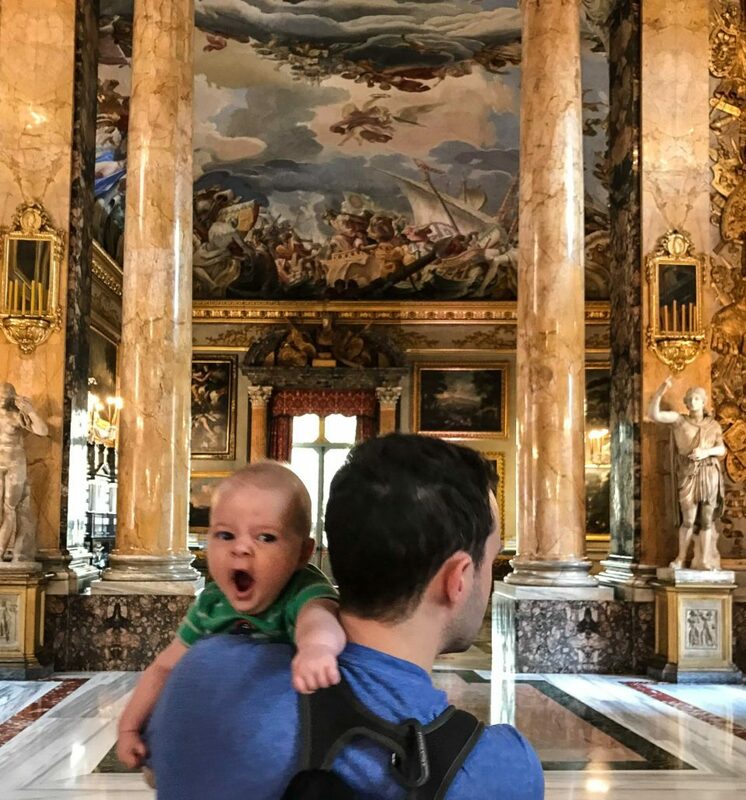 The youngest guest ever to join Context Travel’s exclusive tour of Palazzo Colonna in Rome. Ho hum. We have done more than a dozen Context Travel tours on four continents and have always found them excellent, informative, and enjoyable. You can see our other stories on our Context Travel tours in Buenos Aires, Paris, Berlin, Shanghai, Beijing, Hong Kong, Montreal twice, Budapest twice, Rome twice, Arles, Florence, and Venice by clicking on the links. If you are thinking a Context Travel tour is for you, click here, and see if they have a guided tour available in the city you are visiting. And, there’s a lot more to see and do in Rome. Wouw, the Palazzo Colonna looks absolutely magnificent, and I’m impressed with your interior photography! I’ve taken a Context tour before too; it was really interesting. Thanks, Rachel. I think it’s worthwhile to check out Context’s offerings whenever you plan an itinerary, a good way to see what you might find when you dig deeper. They operate in 35-40 cities now, I believe, on four continents. The Palazzo Colonna looks absolutely fascinating. Such stately pomp and ceremony. Gosh, imagine living there though! It was pretty cool to see how staff cared for the home, to find fresh flowers around, and family pictures. I found it interesting, too, to delve into this time period–neither ancient Rome nor present day. What a gorgeous place. I love the idea of touring a home where the actual owners still live. The art looks intriguing and impressive. And I know the tour must have been wonderful because Context Travel always does a great job. I am putting this one down for my next trip to Rome. Glad to hear it, Donna. Context has so many great options in Rome, and you can always create a custom private tour, too. Happy walking and learning! I did a couple of tours with Context Travel in the past, although not in Rome but in London. Both were excellent and I was really impressed by the guides. Would love to have a private tour in Rome at the Sistine Chapel. You’re right, Kris! I have indeed strolled thru Rome and was unaware of the Palazzo Colonna. Thx very much for sharing.. Loved the pic of the Great Gallery hall. Thanks, Doreen. Even once inside the palace, it’s deceiving how big it is. Three big courtyards (I think we saw two) and the buildings are tens of thousands of square feet. Now that’s some family history as well as a truly amazing family legacy! This is such an impressive “living museum” and WOW is an inadequate comment but it kind of sums up my first, second and third impressions as I scrolled down your post. And you’ve sold me on Context travel too. A tour that combines history, provides a glimpse into the past as to how people lived and provides a way to understand it and personalize the experience is exactly the kind of tour we love. Rome is on our radar for 2017 and I’m looking forward to it now, more that ever! That’s great, Anita. Message me or inquire on our Travel Past 50 Travel Community on Facebook for lots of suggestions, when the time comes.